Disclaimer: This is only the opinion of one man, my personal feelings on these books. It should not be construed as an attack on any of these authors. This book by Leo Zanav is an attempt to make A Study in Scarlett more politically correct. One should never mess with another author’s prose. It’s like saying they did not know how to write, the book is a product of its place and time. The information on the Mormons is correct for the time. The Mormons were under the leadership of Brigham Young. Polygamy was the order of the day. The Avenging Angels were real. Read about the Mountain Meadows Massacre, for example. Changing words will not change history. Annotation is one thing; changing the wording is another. Ted Riccardi weighs in at number nine with this snooze fest. He had another book, The Oriental Casebook of Sherlock Holmes. The stories there are a tad dry, but since they were told from the viewpoint of someone other than Watson, they were acceptable. These are supposed to be written by Watson, and have no relationship to Conan Doyle’s prose. Big mistake, that. Charlie Roxburgh is number eight with this overwritten tale. He started out with promise, but he tried to cram too much information into too few words. Lengthening the story to give space to expand on various sections of the story would probably have made a great novel out of a glorified short story. Not a winner, my friend, sorry. Val Andrews comes in at number seven. The book is simply boring. It could be salvaged, perhaps, but it definitely needs work. And the really sad part is, Andrews has more books out there, and none of them have the tone and feel of Conan Doyle. Also they are so few pages that all of them could go in one volume and not be oversized. Not enough bang for the buck as they say. Allen Vanaman is next on the list. The storyline isn’t too bad, and the Holmes|Watson interaction is fair. But he makes Watson an agnostic (if not atheist) sexual deviant, and Holmes has problems with the Foreign Office. Watson had an eye for the ladies, but he was also discrete. He was married, for Pete’s sake. What happened to Mycroft? I cannot recommend this drivel. Rock DiLiso rings in at number five. It is obvious by the writing that DiLiso has no clue as to the nuances of Victorian England. There are glaring mistakes everywhere. Not a pretty picture, my dear DiLiso, you blew it. Author Bill Paxton is in the fourth spot. Mr. Paxton is a trained Graphologist. The stories are not about Holmes as much as they are about the practice of graphology. Mr. Paxton showcases the method, not the investigator. A book on Graphology as a tool in criminal investigation is what this is; Holmes is pretty much an afterthought. Holmes pilfering from a crime scene to make sure that the police do not discover evidence. Holmes never does this. He leaves evidence for the police to find if they can. Holmes accuses Watson of faking crimes for him to solve. And Watson isn’t so innocent, either. Sherlock Holmes chasing a monkey? Really? Where is the reality of Sherlock Holmes in this muddled mess? Daniel Gracely is number two on our list of shame. There are several things wrong with this story, not the least of which is that it is sold as a novel when it is barely short story length. Mr. Gracely is a trained classical composer with both a BA and a MA. No doubt he is great at musical composition, but this is detective fiction. What we get here is an off-key screech of someone who doesn’t know how to read music. Too bad. 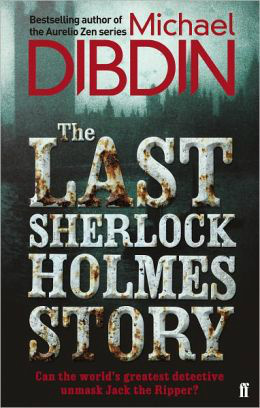 Michael Dibdin should make sure that this is indeed the last Sherlock Holmes story written by him. It could hardly get worse. The story postulates that Holmes and Moriarty are the same, being a split personality. The Moriarty side is Jack the Ripper. Homes commits suicide and Watson becomes a cocaine addict who publishes made up stories about Holmes solving crimes. Total nonsense is too kind a term for this assassination of Conan Doyle’s characters.